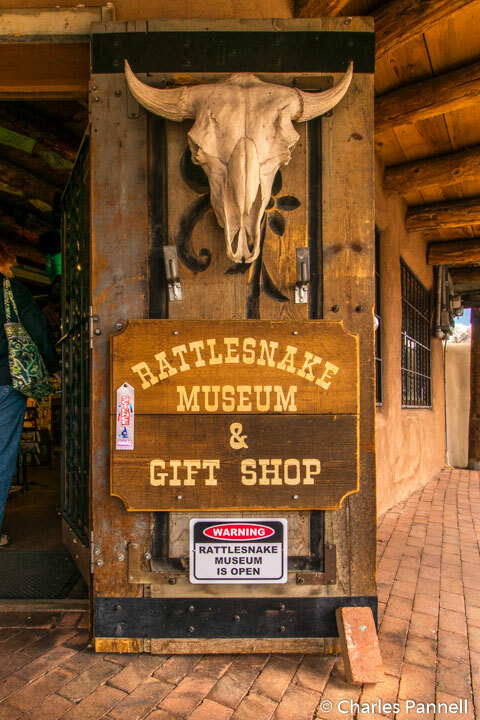 Although the area around the Albuquerque Plaza is filled to the brim with historic sights, quaint shops and regional restaurants, it’s also home to one of the most unusual museums in the state – the American International Rattlesnake Museum (www.rattlesnakes.com). Located on the corner of Old Town Road and San Felipe Street, this often missed attraction features the largest collection of live rattlesnakes in the world. In fact the brochure boasts that the facility houses more rattlesnake species than the Bronx Zoo, the Philadelphia Zoo, the National Zoo, the Denver Zoo, the San Francisco Zoo and the San Diego Zoo combined. Although accessible parking can be difficult to find in Old Town, several spaces are available in the Old Town Plaza Vieja Parking Lot, located catty-corner from the museum on San Felipe Street. From there it’s a level roll to the front entrance of the museum, via a wide level sidewalk with curb-cuts. The brick walkway in front of the museum may be a little bumpy for some folks, but it’s largely doable for most wheelers and slow walkers. Inside, there’s barrier-free access to the exhibits, and a manual wheelchair is available for loan at the front desk. Unfortunately the small unisex restroom is not accessible, so plan ahead (a typical museum visit takes about an hour). 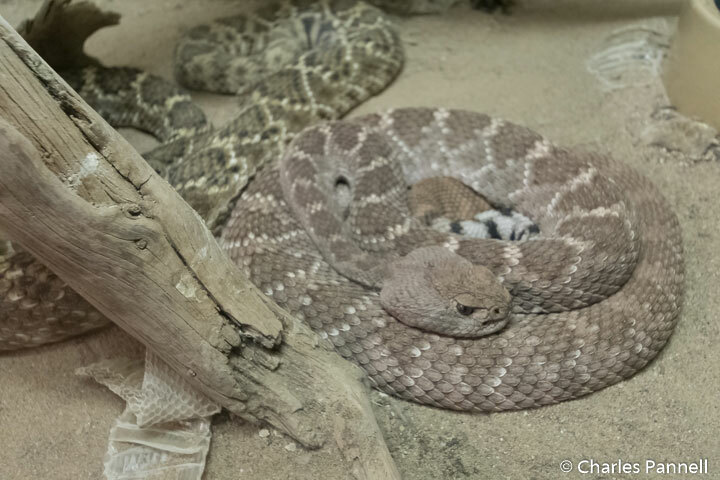 Of course the highlight of the museum is the extensive rattlesnake collection, which features relatively rare species such as the South American Rattlesnake and the Midget-faded Rattlesnake, as well as the more common Western Diamondback and Arizona Black Rattlesnakes. Peppered in between the rattlers you’ll also see a python, a rat snake, a bull snake and even a Gila Monster (one of two poisonous lizards in the world). And the best thing about the specimens is that they are all amazingly active – something that can’t be said of all herpetology collections. 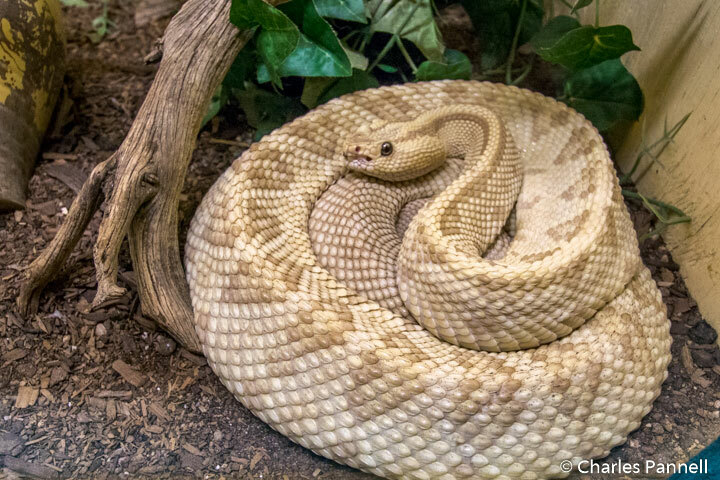 But the American Rattlesnake Museum is more than just live specimens, as it also features Zuni snake fetishes, a Steve Irwin exhibit , a collection of reptilian-themed beers and the only complete reptile-related katchina doll collection in the world. 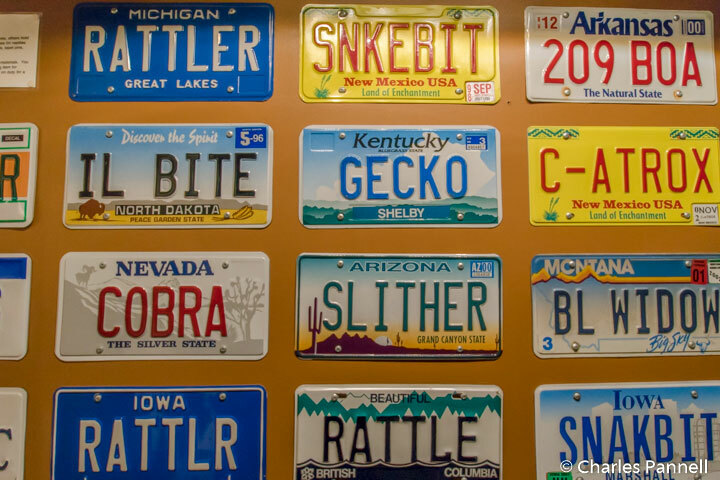 Top it off with a smattering of vanity license plates with catchy phrases like “snakbit”, “rattl’r” and “ven m us”; as well as some captivating videos and you have the complete reptilian emersion experience. Although the “certificate of bravery” visitors receive is a bit kitschy, as is the reptile-themed gift shop, this museum still gets a five-star rating for content. Not only does it present an interesting diversion from the typical tourist haunts that dot the plaza, but it’s also a must-do for anyone with even so much as a fleeting interest in these scaly creatures. And with an admission price of just $5 ($4 for seniors) it won’t break the bank either. 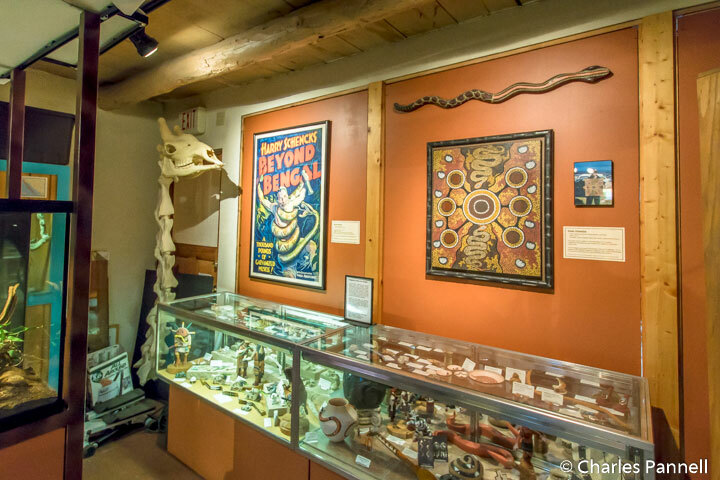 Bottom line – don’t miss the American Rattlesnake Museum, one of Albuquerque’s most underrated offbeat tourist attractions.